The Astley & Tyldesley club was formed in November 1989 and made their on track bow in April 1991, initially racing in the Manchester League. Improvements to the Gin Pit circuit, which was originally mainly funded and built by club members, have been made on an ongoing basis with the venue being afforded the status of the North's Regional Centre in 1997 and being a top graded facility, 'A' Grade International. The club is an accredited British Cycling Go-Ride Club and the venue became British Cycling’s North West Cycle Speedway Academy during 2002. The A&T club boasts a proud record of recruiting and developing their own talent, with home grown A&T riders having won eighteen British Individual titles. A&T have won the Manchester League Division One four times, the Northern K.O. Cup, the Northern Junior League six times, the Northern Junior K. O. Cup four times, the Manchester League Division Two eleven times, as well as the 1997 British U-16 Team Championship. In 2017 A&T became the first club ever to complete a clean sweep, by winning all three divisions of the North & Scotland Regional League, as well as the Northern Regional Final. During the 2003 season the club successfully promoted the World Team Cup. The club acquired the prestigious Sport England Clubmark accreditation early in 2005 - only the 2nd cycling club in the U.K. to do so. The club successfully promoted the 2010 British Individual Finals and the 2011 and 2015 British Team Finals. The club won the Wigan Sports Club of the Year Award in 2011 and 2015, whilst winning British Cycling's Go-Ride Club of the Year Award in 2017. Since 2014 the club has expanded it's activities to incorporate an Off Road section and a Road section, resulting in the change of name to A&T Cycling Club. Major funding in 2016 resulted in the complete rebuilding of the Gin Pit race track to a new specification and professional construction standards. Max Evans – Age 16. He started racing during the 2008 season. Max won the North West Go-Race Grand Prix series and the North West Trophy Cup for the Best Novice in 2009. He retained the NWGRGP series in 2010 and took 3rd place in the British U-8 Grand Prix series. Won the J. Fisher & Sons Club Young Rider of the Year in 2010 and 2012 and Club U-8 Individual 2010. Took an almost clean sweep of honours at U-10 level in 2012 by winning the Club Individual, Manchester League Individual and Grand Prix series, Northern Individual and Grand Prix series, Trans Pennine Grand Prix series. Max took 3rd place in the British U-10 Individual Final, 2nd place in the British U-10 Grand Prix series and scored maximum points as A&T finished 2nd in the U-10 British Club Championship. Also won the Club U-12 Individual in 2012. Took 2nd place in the Manchester League U-13 Grand Prix series in 2013 and 2014 and won the Club U-13 Individual Championship in 2013 and 2014. Won the 2014 Manchester League U-13 Individual Final and finished 2nd in the Northern U-13 Grand Prix series. 2015 saw Max finish 3rd in the British u-13 Individual Final. He won the Northern u-13 Individual Final, Manchester League u-13 Grand Prix series and the J. Fisher & Sons Young Rider of the Year Cup, as well as finishing 2nd in the Manchester League u-13 Individual Final. Max won the 2016 British U-14 Grand Prix series, Club Rider of the Year and Most Improved Rider awards. He won the 2017 Northern u-16 Individual Final. He raced for the North & Scotland team and the Gt. Britain junior team in Australia in 2017, as well as qualifying for the World Junior Individual Final and the World u-16 Individual Final. Max was a key member of the A&T teams which won the Northern League Division 1 and 2 titles in 2017. Matthew Snell – 14 years old. Started racing at the back end of the 2010 season. Took 2nd place in the Club U-10 Individual and won the Club Most Improved Rider of the Year Award in 2012. Matthew won the Northern U-10 Individual title, the Club U-10 Individual Championship and the J. Fisher & Sons Cup for the Club Young Rider of the Year in 2013. Won the 2016 Manchester League U-13 Individual Final and Club U-13 Individual. Was a member of A&T's Northern League Division 2 winning team in 2017. Emily Burgess - Age 13. Emily joined the club at the back end of 2012. She took 2nd place in the British Girls U-10 Individual Final, won the Manchester League U-10 Grand Prix series, Club U-10 Individual Champion and winner of the North West Trophies Cup for Best Novice in 2014. Emily won the Club u-13 Individual in 2015. She finished 2nd in the 2016 Northern Women's Individual and won the J. Fisher & Sons Cup as the Club's Young Rider of the Year. Emily improved dramatically in 2017 and finished 3rd in the British Women's Intermediate Grand Prix series, 3rd in the Northern Women's Individual and raced for the North & East Women's team. She won the Northern u-13 Individual Final, the Manchester League u-13 Individual Final and Grand Prix series. A member of all three Northern League title winning teams, Emily was voted as the Club's Rider of the Year in 2017 for the Alan Farrell Memorial Cup. Deon Dickinson - 12 years old. Deon started racing in 2016. He was a member of the A&T teams which won the Northern League Division 3 and the Manchester League Division 2 in 2017. Charlie Burgess - Age 11. The youngest of three siblings who have raced for A&T, he joined the club at the back end of 2012. Was 2nd in the Manchester League u-10 Grand Prix series and 3rd in the Manchester League u-10 Individual Final in 2015. Injuries plagued his 2016 season, but was still a valuable member of the A&T team which won the Northern League Division 3 and Manchester League Division 2 and again in 2017. John White - 11 years old. John started racing at the tail end of the 2011 season and has regularly beaten riders several years older than him in U-8 and U-10 events since then. Won the U-8 Club Individual Championship and the Club Most Improved Rider of the Year award in 2013. John won the British U-8 Grand Prix series, took 2nd place in the Manchester League U-10 Individual Final and won the J. Fisher & Sons Cup as the Club's Young Rider of the Year in 2014. In 2015 won both the Manchester League u-10 Individual Final and Grand Prix series, as well as the Club u-10 Individual. He took 2nd place in the Northern u-10 Individual Final. John enjoyed terrific individual successes at u-10 level in 2016, winning the British Grand Prix series, Northern Individual Final and Grand Prix series, Manchester League Individual Final and Grand Prix series, and the Club Individual. John moved up an age category in 2017, but won the British u-12 Grand Prix series and the J. Fisher & Sons Cup as the Club's Young Rider of the Year. He was a member of the A&T teams which won the Northern League Divisions 2 and 3 and the Manchester League Division 2. Lucy Grantham - Age 11. Lucy attended the Club Nights for a couple of years, before becoming a regular in competitive matches in 2015. She won the Club u-8 Individual and the North West Trophies Cup for Best Novice in 2015. Lucy won the Club u-10 Girls Individual in 2017. She was a member of the A&T teams which won the Northern League Division 3 and the Manchester League Division 2 in 2015, 2016 and 2017. Tom Morrissey - 10 years old. Tom started racing early in 2017 and improved rapidly. Won both the Northern u-10 Individual Final and the Northern u-10 Grand Prix series, as well as the Club u-10 Boys Individual. He was a member of the A&T teams which won the Northern League Division 3 and the Manchester League Division 2 in 2017. Tom won the Rory Blackwell Cup for Best Newcomer in 2017. Daniel Johnson - 10 years old. Daniel started racing early in 2017 and improved throughout the year. He was a member of the A&T teams which won the Northern League Division 3 and the Manchester League Division 2 in 2017. Fraser Brundrett - 10 years old. Fraser started racing early in 2017 and improved throughout the year. Finished 2nd in the Manchester League u-10 Individual Final and 3rd in the Northern u-10 Grand Prix series. He was a member of the A&T teams which won the Northern League Division 3 and the Manchester League Division 2 in 2017. Duncan Whalley - Age 9. Duncan transferred to A&T at the start of the 2017 season, after racing for Bury for several seasons. He enjoyed a successful season, winning the Manchester League u-10 Individual Final and Grand Prix series and finishing 2nd in both corresponding Northern events. Duncan was a valuable member of the A&T team, which won the Northern League Division 3 and Manchester League Division 2 in 2017. Freddie Cox - 9 years old. Freddie started racing in 2016. He was a member of the A&T teams which won the Northern League Division 3 and the Manchester League Division 2 in 2017. Tom Beeley - Age 8. Tom started racing in 2016. He was a member of the A&T teams which won the Northern League Division 3 and the Manchester League Division 2 in 2017. Sabrina Evans - 8 years old. Sabrina started racing midway through the 2016 season. Was a valuable member of the A&T team which won the Northern League Division 3 and Manchester League Division 2 in 2016 and 2017. Sabrina won the Club u-8 Girls Individual in 2017. Aiden Green - Age 7. Aiden started racing at the tail end of the 2015 season and has improved rapidly throughout. Was a valuable member of the A&T team which won the Northern League Division 3 and Manchester League Division 2 in 2016 and 2017. He took 3rd place in both the 2017 Northern and Manchester League u-10 Individual Finals and 2nd place in the Manchester League u-10 Grand Prix series. Aiden won the Club u-8 Boys Individual in 2017. Winner of the Rory Blackwell Cup for Best Newcomer in 2016 and the North West Trophies Cup for Best Novice in 2017. Frank White - 7 years old. Frank cut his racing teeth in the A&T Go-Ride Grand Prix series in 2015, finishing as the overall series winner and winning it again in 2017. Was a valuable member of the A&T team which won the Northern League Division 3 and Manchester League Division 2 in 2016 and 2017. Frank won the 2016 Club u-8 Individual and the 2017 Club u-6 Individual. Winner of the North West Trophies Cup for Best Novice in 2016. 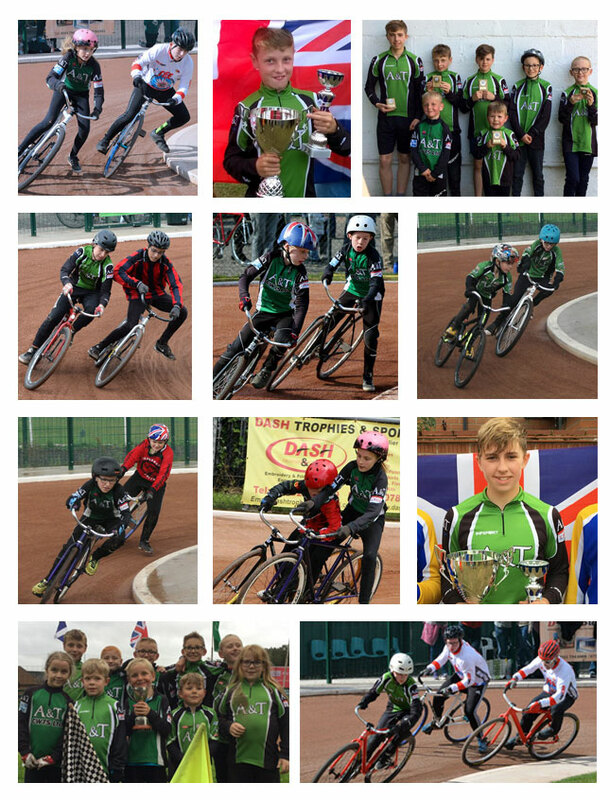 Astley & Tyldesley Cycling Club continued to recruit a large number of new local junior riders during the 2017 season. Some of these will take part in activities at Gin Pit only, but some are looking forward to regular competitive racing in the many junior competitions that are available. Juniors who will looking to make the step up to regular competitive racing include: Oscar Belt, Dylan Ingham, Lewis Skitterall and Freddy Warn. Astley & Tyldesley Cycling Club is a British Cycling Go-Ride Clubmark Club.